Where We Are: Poems from Lexington High School’s Class of 2017 offers a rare glimpse into the hearts and minds of nearly 450 LHS sophomores, sharing what inspires, worries, piques and matters most to them – an authentic look at where they are right now as unique individuals. Where We Are features a foreword by former U.S. Poet Laureate Robert Pinsky. Cited by Robert-Frost-Medal-winner X.J. Kennedy as “the most remarkable gift to student writers that anyone has offered in America” and selected as one of the top 12 high school creative writing programs in the country by Web del Sol (the world’s largest nonprofit publisher of periodicals), The Student Publishing Program (SPP) is a free literary arts curriculum which brings our nation’s top poets into the classroom through on-demand mobile video to help teachers give students of all learning levels the skills and confidence needed to find and express their own unique, creative voices beyond the classroom. 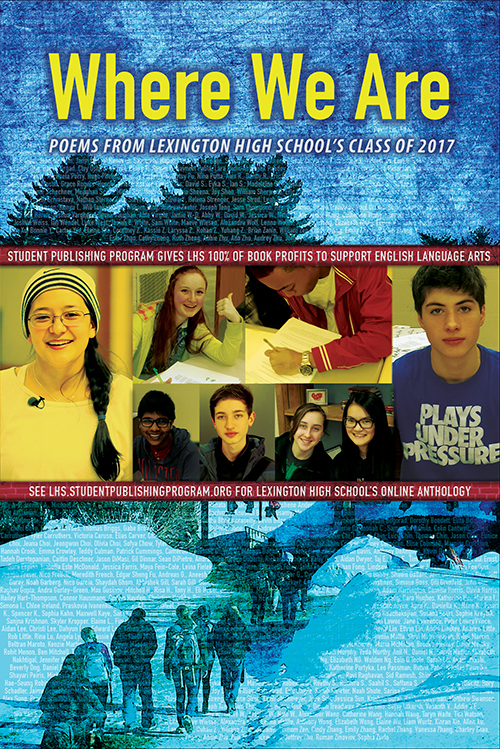 SPP then publishes and promotes their compositions – one piece of poetry from every student in the grade – in an online book and in a print book available in bookstores nationwide, with SPP giving 100% of profits from each school’s book sales back to the school to further support English Language Arts. © 2019 STUDENT PUBLISHING PROGRAM. All rights reserved.